Registered Dental Hygienists now have the ability to apply a simple product that will stop the progression of cavities. “Silver Diamine Fluoride has the excellent benefit of allowing the clinician to halt cavities at the initial diagnostic (or exam) appointment”, notes President Jolley. With the exception of restorative dentistry, to date there has been no other option in the U.S. to stop the progression of dental decay. With the recent approval by the FDA, there is a now a new protocol in stopping cavity progression; Silver Diamine Fluoride (SDF). With an application similar to fluoride varnish, SDF is very simple and quick to apply. The application is as simple as drying the tooth and applying the SDF to the decayed teeth. Clinical evidence suggests a twice yearly application until the baby tooth is lost or the tooth can receive a permanent filling. Silver Diamine Fluoride was approved by the FDA in August of 2014, and the first products were available in April 2015. Used to both slow the progression of decay and stop dentinal hypersensitivity, SDF has been treating both conditions successfully in Japan for over 80 years, illustrating a well established track record with zero adverse effects. Here’s how it works: The silver acts as an antimicrobial towards the decay causing bacteria, while the fluoride remineralizes the enamel structure of the tooth. The ammonia is used to stabilize high concentrations in solution. The silver will remain within the dead bacteria of the tooth as a reservoir, so that if a future bacterial attack takes place, the silver will reactivate, preventing the new “live” bacteria from restarting the cavity. This condition, known as the “zombie effect”, has the dead bacteria essentially killing off the live bacteria, thereby preventing further decay. This allows a definitive solution to decayed teeth preventing the risk of root death and the need for more invasive treatment such as a root canal and crown. Care must be taken during application however, as SDF will not only stain the cavity, but the gums, skin, and clinical surfaces as well. This drawback aside, CDHA President Lygia Jolley, RDH, BA, adds, “One of the great things about SDF is that hygienists can apply it under their current licensed duties, once a dentist provides the cavity diagnosis.” A dental cleaning twice a year can now provide an opportunity to stop the progression of cavities with the aid of SDF and the hygienist. “Silver Diamine Fluoride has the excellent benefit of allowing the clinician to halt cavities at the initial diagnostic (or exam) appointment”, notes President Jolley. Further, it allows a clinician to treat all decay in one appointment, whereas restorative dentistry (fillings) could not be completed in one sitting if the patient has rampant decay throughout the mouth. For those patients with developmental or behavioral conditions that don’t allow for chairside restorative dentistry, SDF provides an excellent solution. (Autism, ALS, MD, etc.) SDF also provides an immediate solution where one was difficult to attain in the past for those patients who are elderly, have dry mouth, take multiple medications, or abuse drugs such as the methamphetamine user. “Think of traveling to a remote location where you only had time to examine and educate patients. SDF would allow the clinician to stop dental decay during that same ‘one time’ visit”, adds President Jolley. 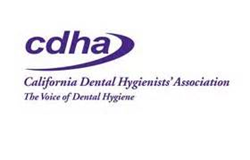 The California Dental Hygienists’ Association (CDHA) is the authoritative voice of the state’s dental hygiene profession. The organization was established 30 years ago when two regional associations merged to form a unified professional group. CDHA represents thousands of dental hygienists.